In February, we had a visitor come into town from Nigeria. For some reason, whilst in the country he developed a slight obsession with Burgers and ended up eating them nearly every day. When he requested that we go to a burger joint, I was happy to oblige, having read about numerous new places over the last few months. Following much research and the want of a bookable joint, we ended up at Burger and Shake, just round the corner from the Brunswick Centre in Russell Square. The place itself is certainly misable, located in a fairly unassuming row of shops. It in no way can be described as a large space, with only 3 or 4 booths and a few additional tables. When I arrived, “GoBurger” and my sister were already seated and munching on some fries my sister had ordered to settle her hunger prangs whilst she waited almost 30 minutes for us to arrive. Having finally looked at the menu, we went on to order, service with a smile it most definitely wasn’t! I was slightly disappointed to see that a restaurant called “Burger & Shake” only had 4 milkshake options on the menu. These consisted of the bog standard, chocolate, strawberry and vanilla in addition to one alcoholic option. It was only later when a friendlier gentleman came to take out dessert order that we were told that there were other “alcoholic milkshakes” that had yet to be added to the menu. We ordered our food and didn’t have to wait particularly long for it to arrive. My sister being in her “veggie for a month” phase ordered the only veg burger on the menu. 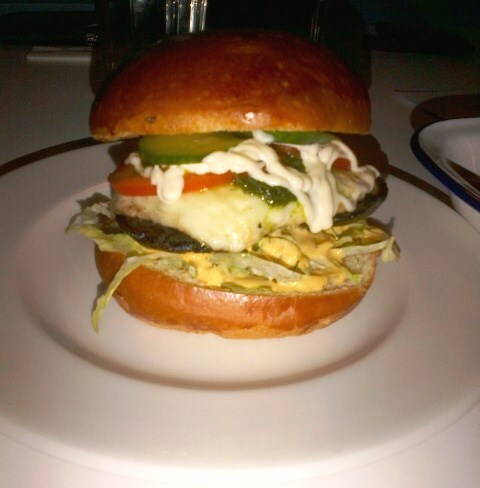 This consisted of Halloumi cheese, portobello mushroom, lettuce, burger sauce, tomato, cucumber, coriander oil and mayonnaise. Her only comment was that as nice as it was, it would have been more filling had the burger been some kind of veg patty rather than simply vegetables and halloumi cheese piled on top of each other inside a bun. With so many meat substitutes out there including soya mince and tofu, it’s sad to see such a lack of imagination when it comes to veg options. The burger & my hot dog arrived next. Having become something of a burger connoisseur, GoBurger commented that the patty was well cooked and juicy, however they failed to ask him how he wanted it cooked. His general opinion was that it was generally a good burger. 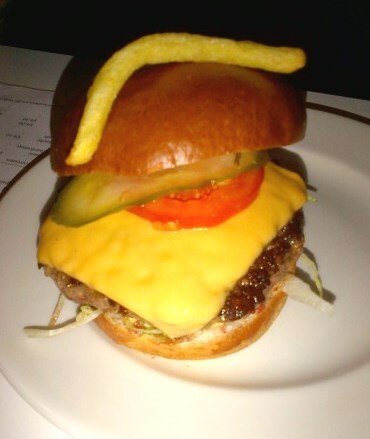 You will notice in the image below that there is a chip placed rather artistically on top of the burger, the reason being that GoBurger decided it would be rude to put up an image of a ‘naked’ burger. 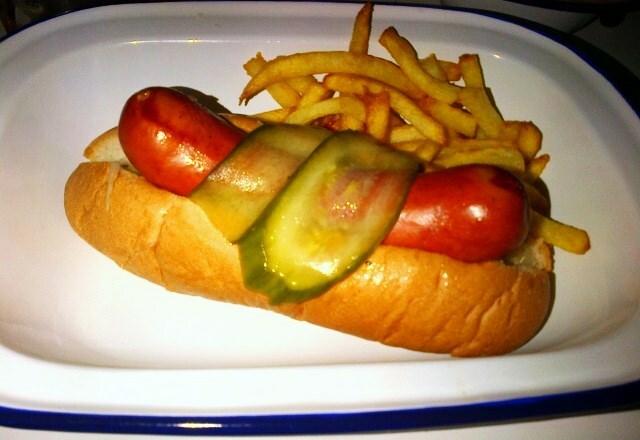 Being a general hot dog fan and at this point still being saddened by the fact that ikea hot dogs had contained horse meat, I felt it would be best to mourn the loss of the humble ikea hot horse dog by ordering one in a burger joint. I was pleasantly surprised. The actual sausage was very meaty and had a good flavour and whilst I would have liked a bit more of the sauerkraut and for portion to have been slightly larger, I was still rather satisfied. I was less satisfied by my ‘chocolate’ milkshake which was not only sickeningly sweet but tasted more like caramel than chocolate. Having devoured our mains, when the offer of dessert was given to us, we rather piggishly (is that even a word) went on to order one of each. 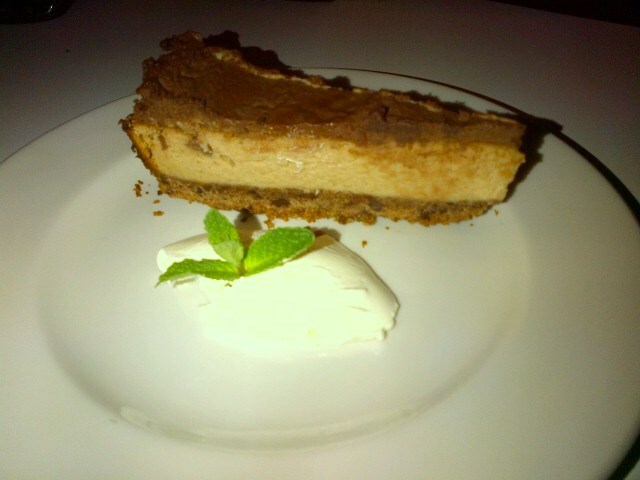 The albeit a little sweet, can only be described as moreish. 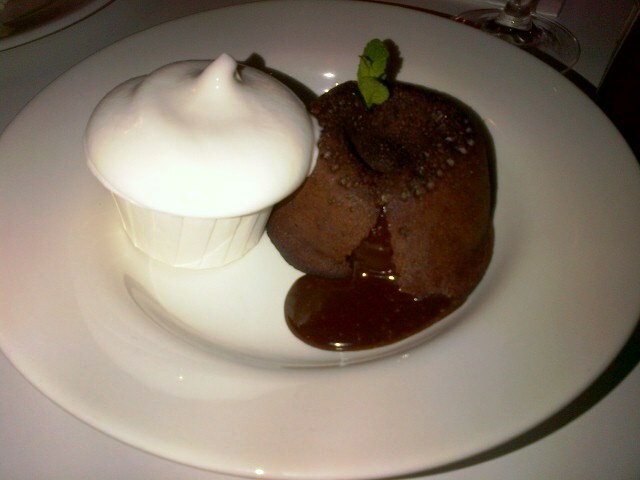 However the mascarpone cream was a welcomed addition which helped to cut the sweetness and made it a lot more enjoyable. The was however the real winner. It was cooked to perfection with the oozy middle. The chocolate was bitter sweet and the soft whip ice cream was the perfect accompaniment. Needless to say, we polished both off with little effort. Overall Burger & Shake was ok, not fantastic but having only recently opened when we visited, I’m sure with time they will find their feet and things will get better. The quality of the food was good and whilst the presentation wasn’t anything out of the ordinary, you can’t expect too much from a burger joint. 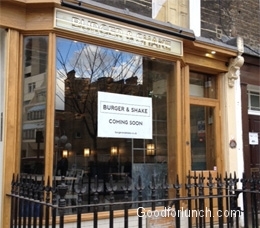 The one thing I’d say is that with so much competition in the market, I’m not completely sure if Burger & Shake will be popular amongst the real burger experts. However based in Russell Square which is a real hotspot for local universities, the reasonably priced food may well become a hit with the students. Since visiting I have been back to the website and the menu now shows a whole array of milkshakes but only two of which are alcoholic shakes! 1. GoBurger is fantastic, he should feature more – naked burgers Pah!